I was pointed to this Richmond Fed article, which relates to Barro and Krugman. Tyler Cowen linked to one of my posts and seems to find something in there to like. Brad DeLong does not like it. Cowen wanted to think of what I do as "neoclassical economics." Some people like to call it "micro-founded macreconomics," and Barro recently called it "regular economics." The people I have learned from, work with, and talk to do economics - they take theory developed by other people, build on it, match the theory to data, and attempt to evaluate macroeconomic policies in a sensible way. Some of those people are sympathetic to Keynesian ideas; some of those people are critical of those ideas. From my perspective this "neoclassical macroeconomics" is merely Hicks (1937) (or perhaps Wicksell (1898)) "plus", as Rüdi Dornbusch liked to say, "original errors". This will be a theme. The pristine ideas are apparently in the classics - Hicks, Wicksell - and we have just thrown sand into the gears. In the Keynesian-or perhaps it would be better to say Wicksellian--framework, when you say that real rates of return are "too high" you are saying that the market rate of interest is above the interest rate consistent with full employment, and with savings equal to investment at full employment. Wicksell called that interest rate the "natural rate of interest" and it is relative to that natural rate of interest that Wicksellian (and Keynesians) speak of interest rates being "too high" and "too low". Thus Williamson is wrong when he say that what we have now--when the natural rate of interest on relatively safe securities is negative and the market rate of interest is not--is "not a Keynesian [or Wicksellian] inefficiency". It is precisely such an inefficiency. To claim that it is not misinterprets Keynes (and Hicks, and Wicksell), and misleads readers trying to understand what they did and did not say. I'm taking my cue here from Mike Woodford, for example "Interest and Prices." Woodford certainly thinks that he is channeling Wicksell, though maybe Brad thinks he's not. In a Woodford New Keynesian model, monetary policy is about moving the market nominal interest rate around, and the transmission mechanism for monetary policy works through the real rate. 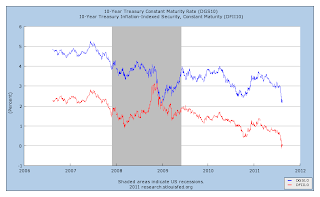 Once you hit the zero lower bound on the nominal rate, the real rate can't go lower. That's the way New Keynesian economists inside the Fed system frame the monetary policy problem in the current circumstances. 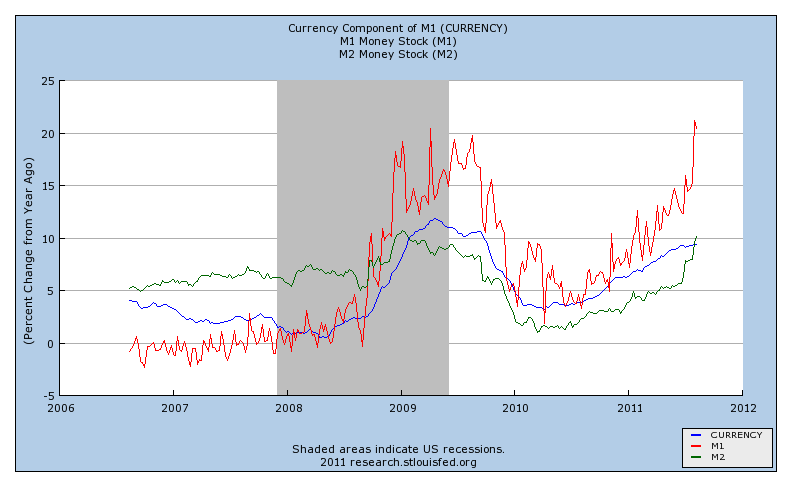 The real rate is too high, you want it to be lower, but monetary policy can't do that in the conventional manner. Here's the interesting part. Brad is characterizing the current state of affairs and says "the natural rate of interest on relatively safe securities is negative and the market rate of interest is not." What I think he is saying is that the safe real rate of interest is low, but the relevant "market rate of interest" is in fact high. I don't think you can find that feature in any "Keynesian" framework where you would be able to correct the problem through some kind of policy Brad might want to prescribe in the current circumstances. But whether you can find it in the General Theory or not, Brad has brought up something very useful. 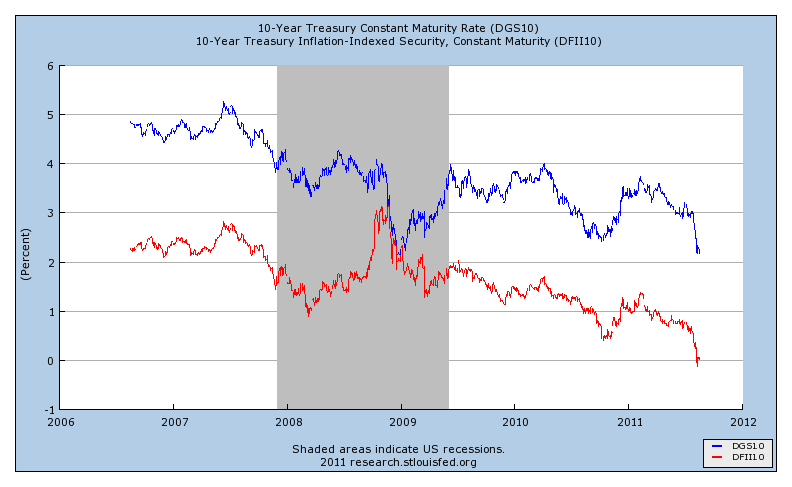 The fact that the safe real rate is low is intimately related to the fact that the "market rate of interest" is high. In fact, you can find this in this paper. The effect is more pronounced in the financial crisis, but I think it persists. The idea is that greater uncertainty and higher costs associated with evaluating collateral and unwinding debt acted to increase interest rate spreads - the spreads between the safe rate of interest and "market rates of interest" - reducing the quantity of privately-produced liquid assets, creating the asset scarcity that lowered the safe real rate of interest. To understand that idea, you don't need to go digging in Wicksell, Hicks, Fisher, or the General Theory. It's elucidated much more precisely in the work of Rob Townsend, Doug Diamond, and other people who worked on modern information theory, contract theory, and the theory of financial intermediation. Don't go there Brad. As I said, it's not in Hicks. Why does pulling spending forward into the present fail while pushing taxes back into the future works? In my post, I was arguing that the problem was a shortage of safe assets, monetary policy could not solve the problem, and we could think of an otherwise Ricardian fiscal experiment that would do the trick. I wanted to avoid talking about government expenditures on goods and services, as that would open up a whole set of issues I did not want to get into - redistribution, alternative types of spending and the government's advantages relative to the private sector, political economy, etc. And yet a third thing I think is wrong is Williamson's claim that "the Fed is powerless" because "swap[s of] reserves for T-bills or reserves for long-maturity Treasuries… essentially amounts to intermediation activities the private sector can accomplish as well, this will have no effect". But such swaps take various forms of duration and default risk onto (or off of) the Fed's and thus taxpayers' balance sheets and off of the private market and thus investors' balance sheets. These are different (but overlapping) groups who perceive risks differently, have different resources, and react to risks differently. The fact that the private market could undo any particular Federal Reserve policy intervention does not mean that it will. This is a key part of my argument - i.e. 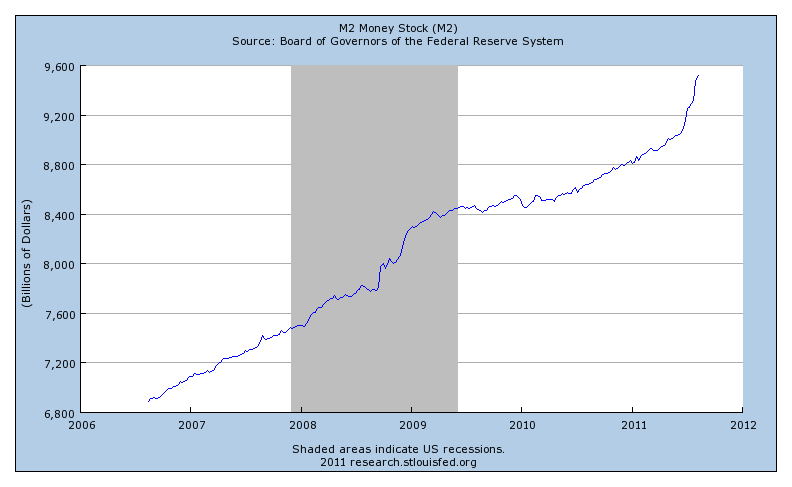 under the current circumstances, quantitative easing is irrelevant. In order for asset swaps to have any effect the Fed has to have some advantage in the intermediation activity it is engaging in relative to what the private sector can accomplish. Currently the Fed has no advantage in turning long-maturity Treasury debt into overnight assets, so QE is irrelevant. I would say go back to Hicks, Keynes, Fisher, and Wicksell, and think about them carefully: they were smart. A "neoclassical macro" that does not start from them has little chance of getting much of anywhere. The General Theory of Employment is a useful book; but it is neither the beginning nor the end of Dynamic Economics. Bernanke's speech seemed mostly on target and sensible, leaning toward growth issues, given the thrust of the conference apparently, but touching on some short-run policy issues. Of particular note is the discussion of the August FOMC policy statement. The important message here is that the majority of the Committee is quite certain that there will be "low rates of resource utilization and a subdued outlook for inflation ..." for an extended period of time, in particular two years. That view seems hard to reconcile with some of the other parts of the speech, which seem to emphasize the uncertain state in which we are in. We can infer that this is the key element of contention on the committee. The dissenters may just be more uncertain than the majority. In addition to refining our forward guidance, the Federal Reserve has a range of tools that could be used to provide additional monetary stimulus. We discussed the relative merits and costs of such tools at our August meeting. This makes it sound like there are some tools in the box that we have not tried yet, and that some of these tools will actually do something. 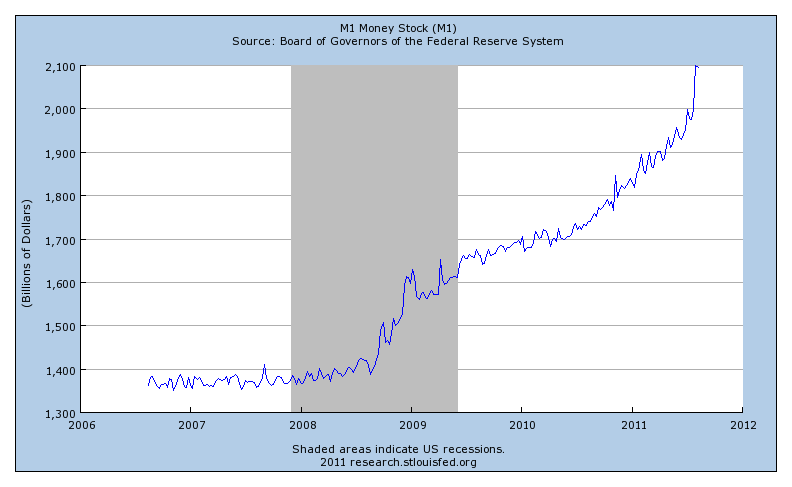 One tool that has been used, and could be used again, is quantitative easing. As I argued here, under the current circumstances more QE is futile. 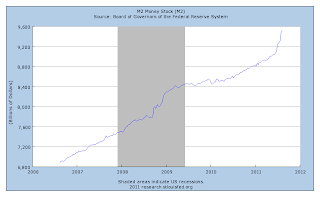 The only tool the Fed currently has that will do anything is the interest rate on reserves. As Bernanke told us last year, lowering that from 0.25% is not an option, so it can only go up. What is not clear from this is whether Bernanke thinks that, at this point in time, the Fed can do anything to bring about a faster recovery. Maybe (actually almost certainly) the FOMC is conflicted about this, and we'll have to wait for the next meeting to find out what they are thinking. Good. That needed to be said. This WSJ article by Stephen Moore was ridiculed by Paul Krugman and David Glasner as anti-intellectual, and Noah Smith used the article in an attempt to ridicule Ed Prescott. Moore's basic argument is that Keynesian economics does not satisfy the rules of common sense, whatever that is, and he gives some specific examples. Moore's discussion is somewhat confused. In particular, he seems to think that modern macroeconomics and Keynesian economics are synonymous. He also argues that, in analyzing unemployment insurance we should only be thinking about the incentive effects, and apparently not about why the government should be supplying the insurance, the role of UI as a transfer, or how the financing of the transfer could matter. However, it's not surprising to me that Moore is confused, and I have some sympathy for the poor guy. Indeed, one could get the idea from reading the blogosphere that modern macro is dominated by the legacy of Keynes, when the truth is that most practicing macroeconomic researchers are not spending their time thinking about multipliers and the paradox of thrift. There are indeed ways in which Old Keynesian economics - basic Keynesian cross and IS/LM - defies common sense, i.e. the common sense that comes from standard microeconomics. What is common sense anyway? It has to be something most of us possess, clearly. Don't put your hand in a fire. Don't cross the street without looking both ways. The latter piece of information came to me along with: Don't run out between parked cars. There were no parked cars where I lived. Everyone parked in the driveway or the garage. Therefore, that did not apply to me. Looking both ways before crossing the street must also not apply to me. When I was 8 years old, I crossed a highway without looking and was run over by a car. I have looked carefully ever since. When I first took economics, here is what common sense was for me. It was the tail end of the hippy era and I thought that people in suits were greedy bad people out to steal from the poor. Rent control was a good thing as it took money from greedy landlords and gave it to poor apartment-renters. Wage and price controls seemed like a good way to control inflation, though I did not quite understand what it was that was inflating. And so on. In microeconomics, my professor convinced me that a simple supply/demand apparatus determining equilibrium prices was a useful way to think about price determination, and he showed us how this apparatus could be used to make sense out of actual prices and quantities that I could observe. Greedy people could actually be getting rich and performing a useful social function. Rent controls could actually harm everyone - rich and poor - in the long run. Wage and price controls could screw up the allocation of resources in a severe way. There is no free lunch. Everything comes at a cost. Then I took macroeconomics which, in terms of the machinery I had built up in taking micro, made little sense. If competitive equilibrium with market-clearing prices was so useful in microeconomics, why couldn't we do that in macro? What is this paradox of thrift? What's this nonsense about the multiplier free lunch? Why did I have to un-learn all the micro I had learned in order to do macro? It took another 6 or 8 years and many readings and re-readings of work by Lucas, Wallace, Prescott, and others, before everything finally made sense. There is nothing easy, natural, obvious, or common-sensical about Keynesian economics. If you try to do it properly, or try to turn it into a story, you come up with more questions than you can answer. Why would we think that firms would shut their doors or would-be workers would remain unemployed because of an unwillingness to lower their prices and wages, respectively? Why would a firm, faced with an increase in customers, increase its output and not its price? Why would many economists, faced with phenomena that appear very un-Keynesian, and with plenty of sophisticated tools available, revert to the rustiest old contraption in the shop? As academics, our policy arguments take place in the following way. We agree on what the state of the world is, but we may disagree on what model we should use to guide policy. Typically our arguments are in terms of the merits of the models at hand. Which model is better? Once we agree on that, then we can determine an operating rule for policy that tells the policymaker what action to take given any possible state of the world. Policymaking on the FOMC seems not to work like that. Some of the non-economists on the committee are not aware of all the models available and how they work. The trained economists may have very different views concerning the merits of the models at hand. Over time, what seems to make the decision-making process work is to have the argument over the state of the world rather than over the theory. Pre-financial crisis, the question would be framed as follows. The FOMC members took as given that they did the right thing at the last FOMC meeting. The question for the current meeting was whether the state of the world was worse, better, or about the same relative to the last meeting. If things were worse, they would move the target for the fed funds rate down 1/4 point; if things were better, they would move up 1/4 point; if things were about the same they wouldn't do anything. Easy. Post-financial crisis, things are not quite so easy, as now we supposedly have some more tools (I say supposedly because this is Bernanke's claim; I actually don't think so). 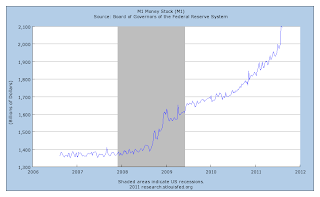 Primarily, quantitative easing is on the table, and so is "extended period" language. But the policy decision is still framed in the same way. Is the state better or worse? Based on the answer to that question, the FOMC either tightens or eases. Then the question is how to do the tightening or easing. So, it's possible that the FOMC might now think that QE2 did not work, in which case maybe they want to try something else. However, Bernanke seems to think it worked, at least that's what he said in this speech in February. As of the end of the QE2 program, Jim Bullard certainly thought the program worked, as did other Fed officials. Thus, in terms of Bernanke's own publicly-stated criteria for what directs easing and tightening, Kocherlakota tells us the state is worse. 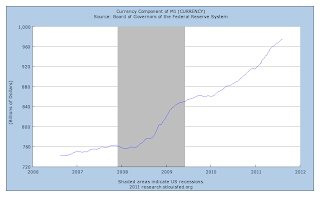 In November 2010, the FOMC agreed that the state of the world directed them to ease. They eased, and according to them the easing worked. The state of the world is now better, so why ease further? I think macroeconomists agree broadly on issues of commitment. The decision rules of policymakers need to be simple enough for the public to understand, and policymakers need to behave in ways that are consistent with their publicly-stated policy rules. If there is a change in a decision rule, that needs to be clearly-communicated. In the case of last week's FOMC decision, there was certainly no statement that the FOMC was thinking about the world in a different way. Thus, presumably the decision rule has not changed. If that is true, than the FOMC's decisions should be consistent with what it has been doing. But Kocherlakota argues that is not the case, and I think he is right. A decision that may appear to make the Fed's behavior more predictable actually makes it less so. Instead of asking why the dissenters on the FOMC voted the way they did, we should be asking why the other people on the committee voted the way they did. And we should not have to ask that. We are now more confused, and that is not good. Here is Narayana Kocherlakota's explanation for his dissent with respect to the most recent FOMC decision. As I mentioned in the comment section of my previous post, Kocherlakota actually has some New Keynesian (NK) leanings, and his dissent is entirely consistent with an NK view of the world. 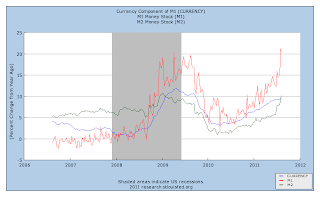 In this view, a Taylor rule dictates monetary policy. In Taylor-rule land, only the current state of the world, defined by the current inflation rate and the current unemployment rate, matters (though some Taylor rules have anticipated inflation on the right-hand side). 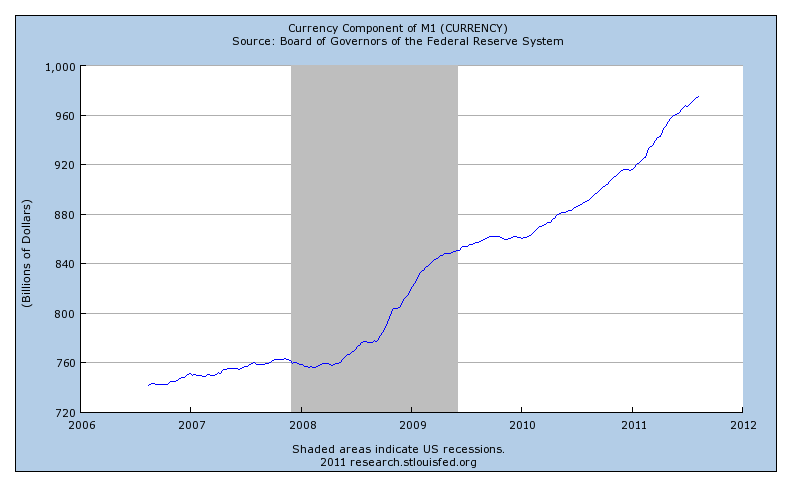 On those terms, the current state actually looks better than the state in November 2010. Inflation is higher and unemployment is lower, which should dictate a less accommodative policy, not a more accommodative one. Thus, if we buy NK, Kocherlakota's dissent makes sense. However, this guy, for example, seems to think that Kocherlakota is ridiculously hawkish and callous toward the unemployed. Seems he just wants to enforce New Keynesian consistency though. I live in non-NK land (or willing-to-be-convinced-but-still-unconvinced-NK-land), so if Kocherlakota's dissent makes sense to me, and it can make sense in NK-land, it must be good, right? John Quiggin is an Australian economist who some of you might be familiar with as the author of "Zombie Economics: How Dead Ideas Still Walk Among Us." Currently he is having a bit of a dustup with the Australian wing of the Rupert Murdoch empire. I knew absolutely nothing about John Quiggin, until someone asked me to write a short review of Zombie Economics for the Journal of Economic Literature. The timing was good, as I was about to leave for Australia to give a plenary talk at the Australian Conference of Economists in Canberra in July. I could read the book on the plane (though a trip from St. Louis to Chicago would actually be sufficient) and might actually come across the man himself, or news of him, at the conference. By the time I got to Canberra, I had read Zombie Economics, and had written a draft of my review which panned the damn thing (more on that later). I was a little lost at the conference as none of the Australian economists I know showed up, but Pete Klenow was there, and I sat down at dinner with Max Corden, who is one of the most engaging people I have run into in my life. Between courses at dinner, various awards were presented, and at one point we got to an the annual award of Distinguished Fellow of the Economic Society of Australia. Previous recipients included my dinner companion Max Corden, Trevor Swan (he of the "Solow-Swan model"), and Murray Kemp. Who did the 2011 award go to? John Quiggin. What is Quiggin's claim to fame? His early work is an odd mix of agricultural economics and decision theory, but he seems to have distinguished himself mainly in public policy. He writes regularly in the mainstream media, writes a blog, and Zombie Economics appears to have sold well. Now, what is Quiggin up to in Zombie Economics? Roughly, Quiggin is the Australian farm team in the Krugman/Thoma/DeLong league. Quiggin argues that there are five key "zombie ideas" that have been used by conservative economists for ideological purposes. The financial crisis has showed us that, without question, these ideas are wrong. Nevertheless the ideas, like zombies, continue to walk. If you read the book, you'll see why it could sell well in airports. However, I would recommend Life by Keith Richards (which is the last book I bought in an airport) over Zombie Economics any day. Keith is much more interesting, and the economics is better. 2. The Efficient Markets Hypothesis. The Great Moderation: Quiggin is a little confused on this one, as the Great Moderation simply characterizes a set of properties of US aggregate time series. From about 1985-2007, inflation was lower and less variable, and real GDP was less variable about trend than had been the case previously. Quiggin is certainly correct, though, in finding fault with those (Ben Bernanke included) who wanted to argue that the Great Moderation was due to a regime change in economic policy. If policy was so great, it should have done a better job over the last four years. The Efficient Markets Hypothesis: For Quiggin this is "the idea that prices generated by financial markets represent the best possible estimate of the value of any investment." Here, Quiggin is badly confused, but maybe the finance practitioners are not helping him out much. Market efficiency is simply an assumption of rationality. As such it has no implications. If it has no implications, it can't be wrong. Dynamic Stochastic General Equilibrium: Quiggin claims that this is "the idea that macroeconomic analysis should not concern itself with economic aggregates like trade balances or debt levels, but should be rigorously derived from macroeconomic models of individual behavior." I can hear you snorting with laughter. Why is "but" in that sentence? Like the "efficient markets hypothesis," DSGE has no implications, and therefore can't be wrong. Indeed DSGE encompasses essentially all of modern macroeconomics. Which of our models is not dynamic, with uncertainty (and therefore stochastic), and with some equilibrium concept. Indeed, many of them incorporate trade balances and public and private debt. 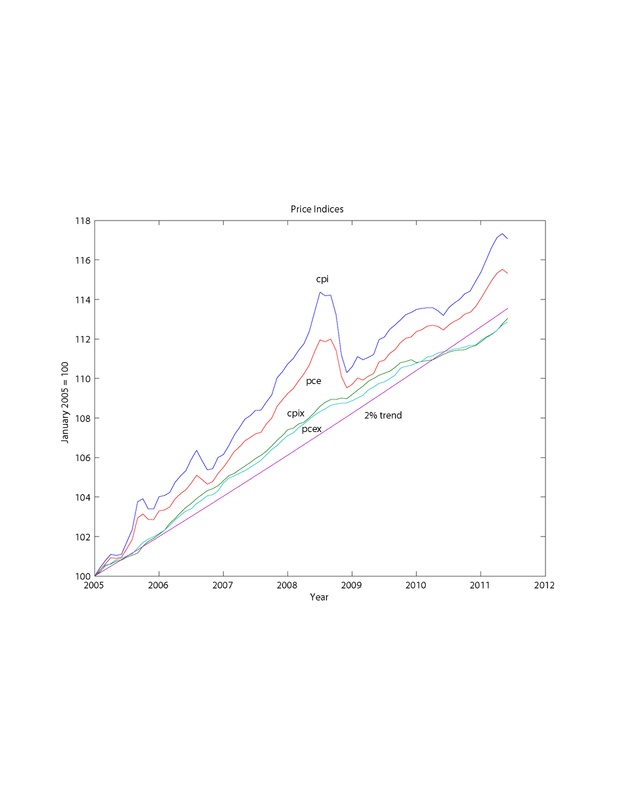 Granted, some of our models were not so helpful in making sense of the financial crisis. But others were, and some of the models that were not helpful could be (and are being) modified so that they are. Trickle-down economics: This one puzzled me. For the previous three zombie ideas, Quiggin is confused, but I could see where the confusion might come from. However, while the words "trickle-down economics" are familiar to me, I have a hard time associating that idea with the mainstream ideas of any academic economists. 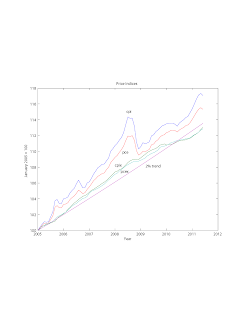 On some level, it seems obvious that economic growth benefits all residents of a country. Whatever my skill set, I would rather ply my trade in the United States than in Malawi. While there may exist serious barriers to economic mobility in the United States that we should be addressing, the financial crisis does not somehow point out some serious deficiencies in how economists think about the income and wealth distributions. Privatization: Here, Quiggin offers a litany of government privatization efforts gone awry. If I wanted to, I could take this evidence as supporting the hypothesis that government is really bad - so bad that it can even screw up privatization. So, the heart of economic thought is a set of zombie ideas that should die a miserable death. But to be replaced by what? Quiggin is pretty vague about this. He thinks that "heuristics and unconsidered assumptions inevitably play a crucial role," and that economics should focus "more on realism, less on rigor." Eureka. We need some sloppy, realistic, heuristic models with unconsidered assumptions. It's unfortunate that some of the people who write so much about economics for the general public spend so little time reading about what economists actually do, and attempting to understand it. No wonder people are confused.